WCC general secretary Olav Fykse Tveit and Prince Ghazi bin Muhammad of Jordan during the Inter-religious delegation’s visit to Nigeria. JOS, NIGERIA — Members of the Church of Christ in Nigeria (CCN) in the Jos region are fleeing their homes, fearful of more violence in the wake of last weekend’s mass killings in Plateau state, according to Open Doors News (ODN). CCN officials told media that after a week of rising tensions between the mainly Muslim ethnic Fulani and the mainly Christian ethnic Birom, about 50 members of the Church of Christ in Nigeria around the village of Maseh had fled their homes, taking refuge July 7 in the home their pastor. The gunmen came Saturday, entering the home and opening fire. Then they burned the house, ODN reported. ODN reported that church officials said that in all, about 100 Church of Christ members were killed in the weekend attacks in 12 villages: Maseh, Ninchah, Kakkuruk, Kuzen, Negon, Pwabiduk, Kai, Ngyo, Kura Falls, Dogo, Kufang, and Ruk. “They are psychologically traumatized, and their productive economic activities are impeded,” said Rev. Obed Dashan, general secretary of the Church of Christ in Nigeria, of surviving church members. ODN went on to say that church leaders claim the Nigerian government is turning a blind eye to persecution of Christians in the country, and fear more violence will occur as a result. Meanwhile in Geneva, the World Council of Churches (WCC) and the Royal Aal Al-Bayt Institute for Islamic Thought (RABIIT) on July 12 issued a report on their joint commitment to help in resolving the tensions in Nigeria. The report reflects a new Christian-Muslim model of cooperation for peace between religions and further interfaith dialogue. According to a media update, the report follows the high level inter-religious delegation’s visit to Abuja, Jos and Kaduna, Nigeria, from May 22 to 26. “Religion should never be used as a pretext for conflict. We are committed to the situation in Nigeria. We are concerned and anxious for the lives that are lost in the name of religion in Nigeria,” said Rev. Dr Olav Fykse Tveit, general secretary of the WCC. The report discusses the complex reasons behind the violence in Nigeria and suggests that the conflict goes beyond religion. “From what we have witnessed, it seems to me that the primary causes of the current tension and conflict in Nigeria are not inherently based in religion but rather, rooted in a complex matrix of political, social, ethnic, economic, and legal problems, among which the issue of justice – or the lack of it – looms large as a common factor,” said Prince Ghazi bin Muhammad of Jordan, chairman of the RABIIT. The delegation admired the vast majority of Nigerians who do not want their religion to be used to propagate violence. It voiced hopes that its collaboration will further Christian-Muslim cooperation and empower religious leaders in Nigeria to continue the conversation that they have started. Both the WCC and the RABIIT plan to work together with individuals and institutions in Nigeria on projects that include developing a common statement for people to sign. Based on both their religious traditions, they pledged themselves to work for the peace and well-being of Nigeria. They hope to initiate theological publications for peace, contributing to the harmony in both Muslim and Christian scriptures. 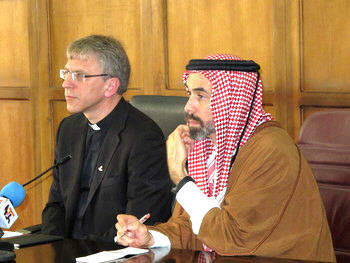 The delegation to Nigeria was led by the WCC general secretary and Prince Ghazi. During the visit delegates met with government officials, religious leaders, traditional rulers and the families of victims of violence. The World Council of Churches promotes Christian unity in faith, witness and service for a just and peaceful world. The WCC general secretary is Rev. Dr Olav Fykse Tveit, from the [Lutheran] Church of Norway.